The AHLIS debate 2017 was hosted by West Point School on the 13th of May 2017. Despite the rains, there were eleven schools participating. Team Gyanoday Niketan comprised of Nischal Chettri IX Sc and Sitoshna Chettri IX Sc. The topic for the debate was ‘Competition leads to progress’. After the announcement of the debate topics,an hour was given for the speakers to prepare. While the preparations were going on the spectators were entertained by a short musical programme. All the speakers spoke well and an atmosphere of healthy competition, enthusiasm and determination prevailed. The programme concluded with the announcement of the results and ‘Gyanoday Niketan’ was declared the proud winner. 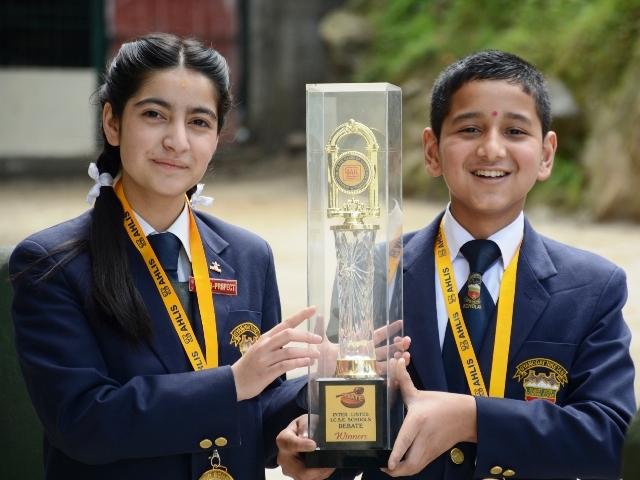 Nischal Chettri and Sitoshna Chettri were both awarded the prize for the best speakers speaking ‘for’ and ‘against’ the motion. The school debate team hopes that winning the AHLIS debate becomes a trend and wishes the future debaters the very best of luck.